Did you know there are plenty of ways to play free money casino games? And some of them offer legit ways to win real cash prizes too. These games - known as social casino games - are different from those you'll find in online casinos, in that while there is often no real money wagering involved, there are options to spend money by buying in-game items like gems, power-ups, or additional cash. And they're hugely popular, with Chumba Casino being one of the leaders. 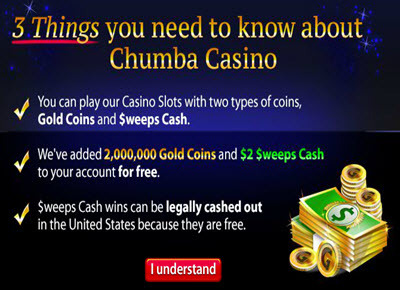 With two top level ways to play, Chumba delivers a wide range of gambling type free-to-play or sweepstakes games. They'll even give you free money to start off with, plus you can play on the Facebook page or on the website version. If you really want to play real money games for cold hard cash, I'd suggest you track down a game that pays out lots of wins like 3 card poker, but right here we're going to review what Chumba Casino has to offer in the way of free gaming. The brand has quickly become a legal, safe and trusted way to play casino games without risking (too much) of your own cash. Chumba Casino is operated by Virtual Gaming Worlds out of Perth, Australia. With a range of such activities as different styles of poker, a wide range of free video slot games and other online casino games, Chumba Casino seems to have found a place in social media that allows the inner gamer in us to play. There's a chance to win real money through the proprietary sweepstakes model with well over a million registered players signed up and enjoying the games. If you're wondering how Chumba Casino works and how to play the games, there are essentially two ways to play - for fun using virtual gold coins or for real cash using the bonused currency called ‘Sweeps Cash’. Gold coin packages of anywhere from $5 to $300 can be purchased via the welcome page and appear in your account with an equal value bonus in “Sweeps cash”. They can then be used for real money sweepstakes games. Various promotions and giveaway offers give ways to get extra gold coins. Once you have an account the games themselves are straightforward to play. Even if you're not sure it's all free, so dive in and learn with no risk. If you prefer real money games it's worth reading about other options on one of the reviews sites like top5onlinecasino.ca. When you buy gold coins - these are automatically deposited in your Chumba account to the value stated in the window when you make a purchase. By entering Sweeps giveaway competitions listed on the Facebook Page - a good example of this are the regular contests which invite you to comment on posts and answer questions related to the games to win cash. 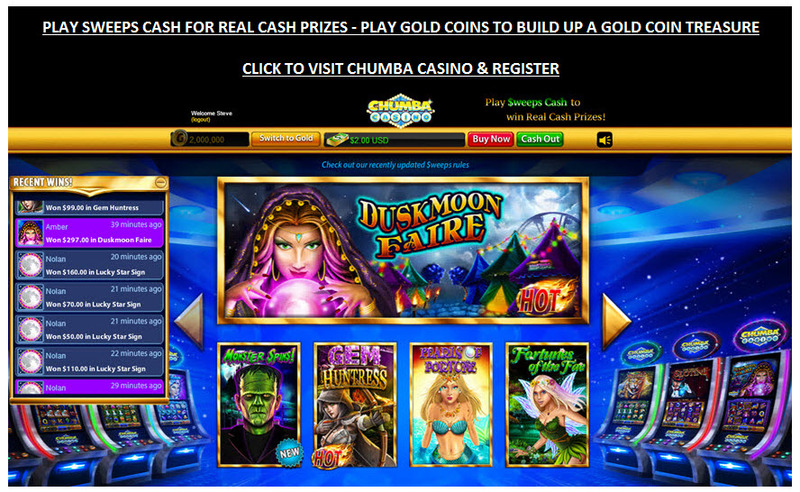 VIRTUAL GAMING WORLDS, CHUMBA CASINO SWEEPSTAKES DEPARTMENT, 548 MARKET ST #73140, SAN FRANCISCO, CA 94104. You'll need to add your full name and return address to the front of the envelope with the words "Sweepstakes Credits:" followed by the current month and year (example: Sweepstakes Credits: April 2016). For each request submitted you can get $6 (600 Sweepstakes/Prize Promotion Cash), which is credited to your account as $1USD (100 Sweepstakes/Prize Promotion Cash) per day over 6 consecutive days. You can send in up to 5 separate requests per month and end up with $300 worth. All cash prizes are paid out via PayPal. Once you've got hold of some Sweepstakes cash, you have all you need to be able to play games inside the app for the chance to win cash prizes. Remember you'll need to use the Sweepscash to do this as opposed to any Gold Coins which are of course only used for totally free play with no real cash prizes. Playing with Gold Coins wins you more of the same, which can be used to increase the free playing time available. Each available game can vary in the amount you'll need to play. This is clearly detailed next to the game itself. Increasing the stakes can increase the win amounts, just the same as in regular real cash online casinos, with potential wins labelled in a 'win table'. While playing Sweeps games, the maximum that can be won on any one spin is $5k, even if the win payout is shown as higher. Any cash won is added to your account and paid out on request in USD to Paypal. The rules state a minimum cashout request of $100, and you'll need to provide proof of identity when making any cashout request. Make a special note of this - I've seen a number of 'complaints' from players saying they can't withdraw winnings when they've not provided valid ID details. US players should note they may be liable to taxation if their total win amount in the tax year is over the threshold. Chumba casino games include 3D Slot Machines, Blackjack, Baccarat, Roulette, Keno, Video Poker and many more. Most games are based Betsoft, Quickfire, or Microgaming software, widely recognised as three of the leaders in the casino software field. Betsoft in particular are a name you'll want to watch out for, especially for their range of 3D video slots and table games but also for their highly recommended collection of mobile games. So for the social casino game lover, Chumba Casino is paving the way for real cash rewards in the virtual casino market by cashing out on real cash rewards. Here you can learn how to play any of the huge selections of games that Chumba Casino has to offer as well as receive tips that the pros use. Using the sharing feature is a great way of getting bonuses. You can invite friends to join in on the action, or you can brag about your winnings. All the while racking up your own points to keep the action rolling. Chumba Casino also offers plenty of free gaming options on YouTube. As far as Facebook goes, with over 395K likes, somebody must be having fun. So now it’s time for you to join in. All casinos offer promotions to attract new players. In most online casinos where you play for - and risk losing - real cash, these often appear in the form of sign up bonuses where you'll deposit a cash amount and get the same or a multiple percentage amount added on for 'free'. Of course it's not actually free, you'll need to deposit money to get the bonus, and play through it many times to be able to withdraw. Chumba is different. The main promotion on offer is a free coins one. You'll automatically get a free $2 in your account on registration, but if you hit the 'buy now' button at the top of the welcome page a popup will appear giving you the chance to buy $10 worth of gold coins for just $1 - that's 900,000 gold coins. If you want to get started just visit the Chumba home page and register. Signing up is easy, takes less than a minute, and commits you to nothing. Enter your name, email, and accept a couple of conditions (confirming you're over 18 and in a region which is eligible to receive cash prizes) and you're in and ready to start. On first registration you'll be presented with the brief welcome message shown in the image to the right. The Chumba Sweepstake/Prize Promotion is open to legal residents of the US and Canada. Players from other countries can register and play games, but not for SweepsCash. The site has been running now for a few years without any major signs of issues. As far as anyone is concerned, it offers a legitimate way to play for real cash for US residents, and obviously there are no issues for anyone in the UK. 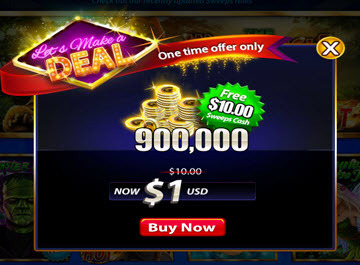 The offer of free cash under a 'no purchase necessary' clause places the games into a non-gambling category which positions Chumba outside of US gambling laws. If you do have any concerns remember that Chumba is just one of many social gaming casinos you can find on Facebook, and you'd have to expect that FB would have shut them down long ago if there were any legality worries. All in all, there's no real evidence of any scam. There are some complaints of not getting paid (though some of these seem to be down to ID issues) and also of low or infrequent wins on some games (though we have to recognize that these are casino games, they're going to be volatile at times). There are plenty of reports of players winning and getting paid good sums. Are There Any Game Cheats? Whenever there's money at stake - either real or play - there will be many of us looking for cheats that will help us build up cash reserves quicker. You won't find games of skill at Chumba, and it's these that often have hidden cheats that can give you added success. Sadly there aren't any cheats I'm aware of that will help build up your Chumba cash balance. Casino games are well designed so that this isn't possible, and remember that the software that drives Chumba games is supplied by leading casino industry software houses. You'll need to trust to luck to build up your bankroll, or take advantage of the many promotions and bonuses on offer. Chumba clearly recognize the importance of strong Customer Support, with any queries received expected to be responded to in the same day. You can submit support enquiries or complaints via the Facebook page and Facebook messaging, or by submitting a request via Zendesk by signing up at: https://chumbacasino.zendesk.com/home. The support on offer looks to be trustworthy, I've been unable to find any reports of Customer Service issues online or in fact of any widespread general complaints about how Chumba Casino works. You can get straight to Chumba via the apps page on Facebook, and for anyone interested in facts and figures about Facebook visitors this page on social tracking site Socialbakers.com lists the latest statistics. The Twitter Chumba Casino page is useful for keeping up to date with promotions and giveaway contests as well as info on any new game developments, while for anyone on Linkedin you'll also find a dedicated Linkedin page. For a social casino operator that's been running for a few years there are surprisingly few complaints listed online. I've managed to find one Facebook page with about 20 likes and one or two comments on casino forums that do not paint Chumba in a good light. You have to note though that these are very low numbers compared to the volumes of people that do use the site. If anything is a scam or a service that's just plain poor, you'll normally be able to easily find many complaints around it. So the fact that there are so few bad comments suggest there are many happy users. I haven't spoken to any disgruntled users, but my guess would be that some of those have either used the site incorrectly or were expecting too much. It's probably best to view Chumba as what it is - a straightforward way of playing social casino games, with the added option of playing for fairly low amounts of real money prizes and the occasional chance of a bigger win. If you're truly worried about being scammed though, then don't take my word for it. It's easy to run a 'chumba complaints' search and run through the results. Feel free to let me know if you find anything concrete and I'll happily publish here for others to take note of. You've got to remember that online casinos (and land-based ones) exist for one reason - to take your money and make a profit. It's something they're particularly good at. In all of winmoney101's reviews of casino gambling, it's clear that to have the best chances of winning you need to limit your involvement to card games like 3 card poker, or to limit losses by playing in slots tournaments. Unfortunately Chumba is no different. You may well win some big amounts on the free play Gold Coin games (which are not for real cash), and occasionally you'll win big on the Sweepstakes real cash games. But overall you're likely to lose in the long run. Treating casino gaming as a fun pastime is the only safe way. Play for fun, don't deposit more money than you can afford to lose, and try to keep to games which either have a high fun factor or offer good payouts for clever strategic pay. Regarding the potential to actually win money playing Chumba games, one of the biggest complaints I've seen is around the lack of transparency on payout percentages. This is one of the major factors in determining the level of trust you can place in an online casino. Chumba doesn't seem to list them anywhere, leading to uncertainty about the overall chances of winning. Although there are no obvious fears over the legality of the gaming, and there are reports online of big wins, this is something Chumba's owners would be well advised to put right to build up the trust levels. Want to play poker where you can win the free sweepstake style prizes you can win on Chumba's casino games? Read about GlobalPoker.com and find out how it works. Given you'll most likely be playing small amounts on any of the games, the $100 minimum cashout level does seem on the high side. Eveidence suggests that unless you hit one of the big wins, it could take some time to build up a bank of over $100. Plus the longer you play casino games, the more likely statistically you are to lose whatever you've built up. All in all, $100 as a cashout limit is too high. For free play games with chances to win real cash too there are not many great sites like Chumba, certainly not operating with the same model anyway. There are plenty of other ways to play games for money that involve some risk to your own money though...this site at realmoney.games lists many of them. For casino games specifically - although not available for US residents - you could try out the range of games at 10Bet casino.